Yes, I had a Gilbert Chemistry set as a child in the 50's. I also had a manual for Gilbert's Hydraulic set, which apparently consisted of various small pipes, valves, and balloons. The manual included instructions for building several different kinds of water cannons. I remember thinking that this sounded extremely cool, and wishing that I actually owned the set, not just the manual. Does anyone else remember this? BTW, I hope those electrons were in elliptical orbits, not parabolic ones! I enjoyed reading about the atomic lab. I also recall a Lassie show from the period where Timmy gets contaminated by a missle. You might find my site Rad Decision.blogspot.com interesting. Ahhh, but let us not forget the Chemcraft Atomic Energy Kit from the Porter Chemical Company (later Lionel/Porter) of Hagerstown,MD! Sort of off the subject, I was astounded* to find that an entire book had been published about the Chemcraft Co., The Chemcraft Story: The Legacy of Harold Porter (review here, about midway down the page) and that some people attribute their professional careers to science kits such as these. *Astounded because I'm related to the Porter family in convoluted ways. Their gift of a basic Chemcraft kit set off a lifelong fascination with science and, well, underground technology. In 1956, I was six years old and a contestant on the Rootie Kazootie tv show. 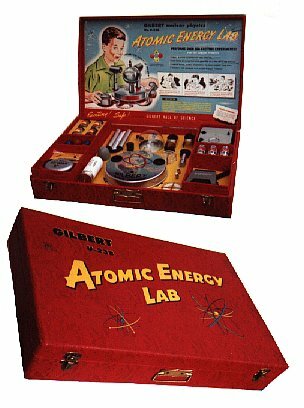 I won a Gilbert Atomic Energy Lab. I remember the geiger counter and all the fun I had with the set. It was like a small suit case and I often carried it around with me. I sure wish I still had it.